A Bank is a Financial Institution that accepts deposits (in the form of cash/ online transfers), creates credit on the deposits and lends money to the borrowers at a specified rate of interest. Indian Public Sector Banks are those banks whose majority stake (>50%) is held by the Government of India. The shares of these Indian Public Sector Banks are listed on stock exchanges. 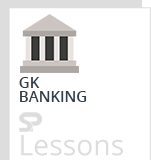 Static GK is very important section in several bank related exams like IBPS, SBI and other bank related employment exams have banking awareness questions along with general awareness section. The Banking Awareness section primarily has questions related to the History of Banking, Banking Terms, Banking Products, Functions of Banks, Banks and their Taglines, Schemes, Committees related to Banking, Headquarters of Banks, most recent Banking News, Apps launched by Banks, New Schemes, Monetary Policies etc. The article Banks and Headquarters presents the list of banks with their Headquarters, Tag lines, and MD and CEO for both Public sector and Private sector bank. Bhartiya Mahila Bank New Delhi Empowering Women, Empowering India.